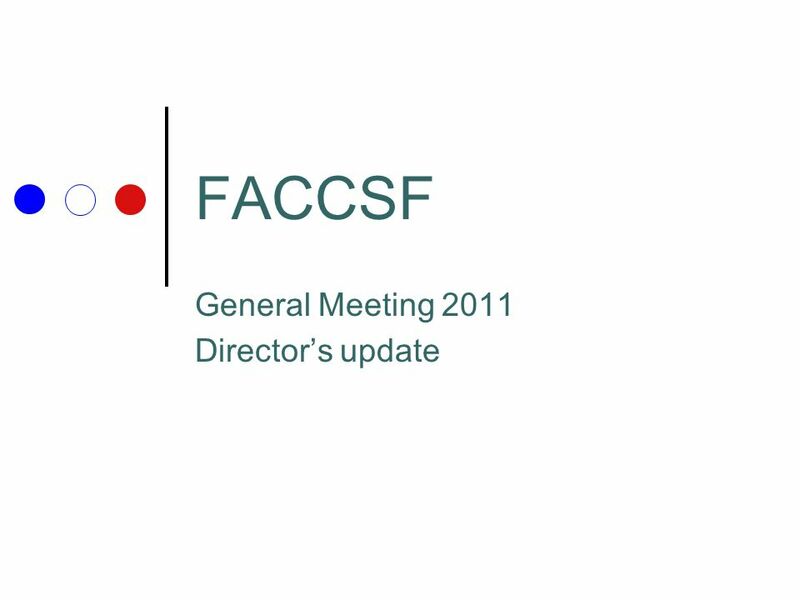 FACCSF General Meeting 2011 Directors update. 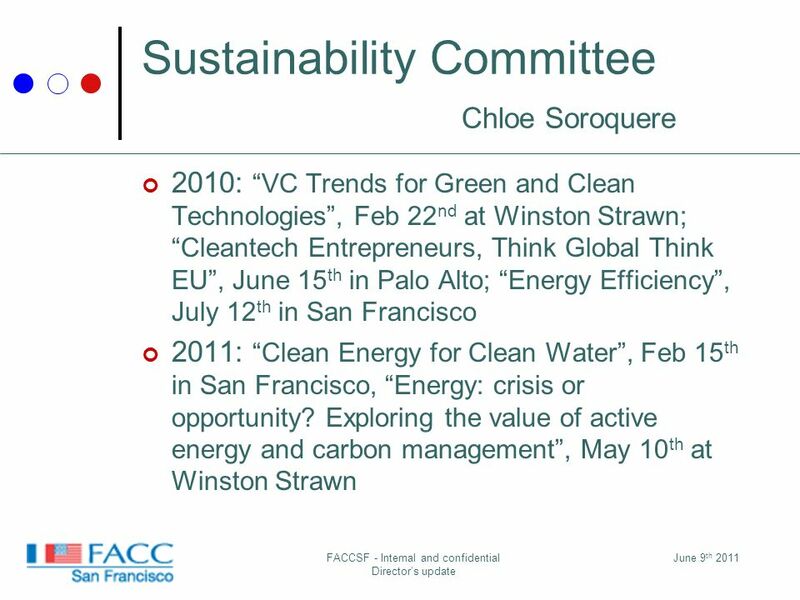 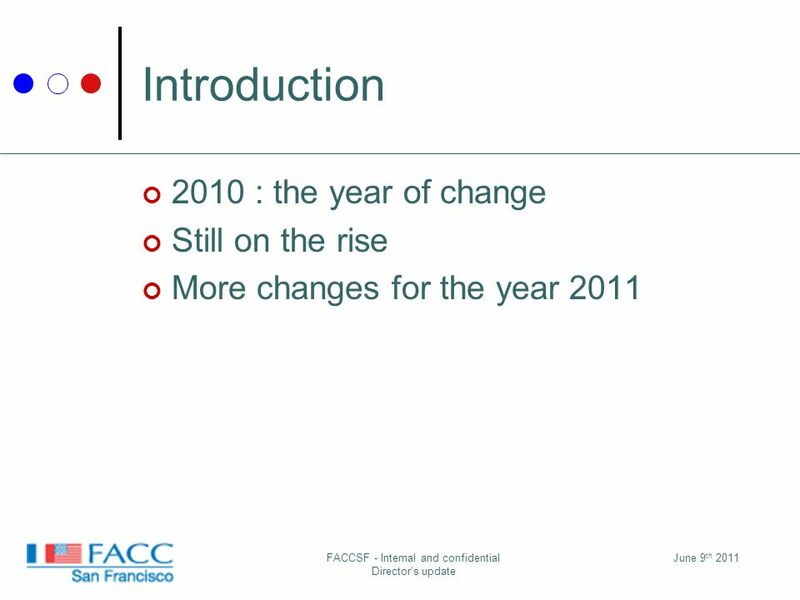 Introduction 2010 : the year of change Still on the rise More changes for the year 2011 June 9 th 2011FACCSF. 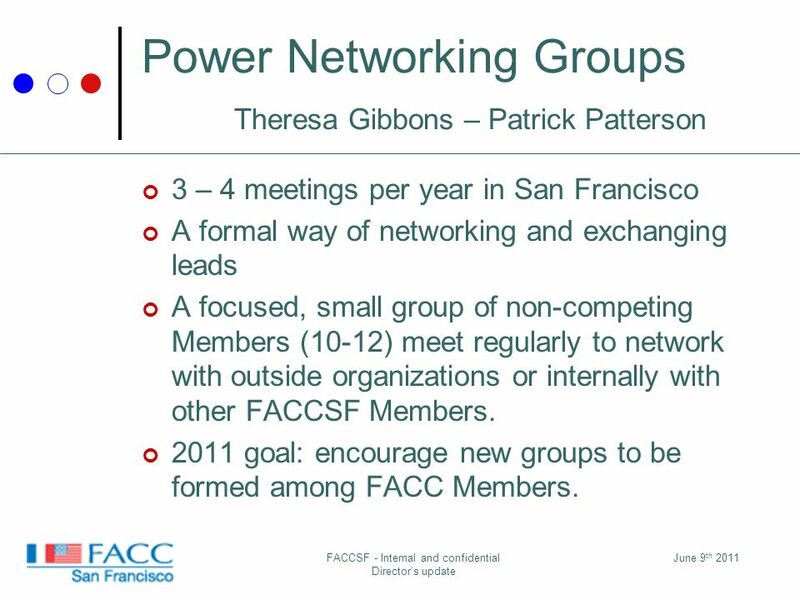 11 June 9 th 2011FACCSF - Internal and confidential Directors update Power Networking Groups Theresa Gibbons – Patrick Patterson 3 – 4 meetings per year in San Francisco A formal way of networking and exchanging leads A focused, small group of non-competing Members (10-12) meet regularly to network with outside organizations or internally with other FACCSF Members. 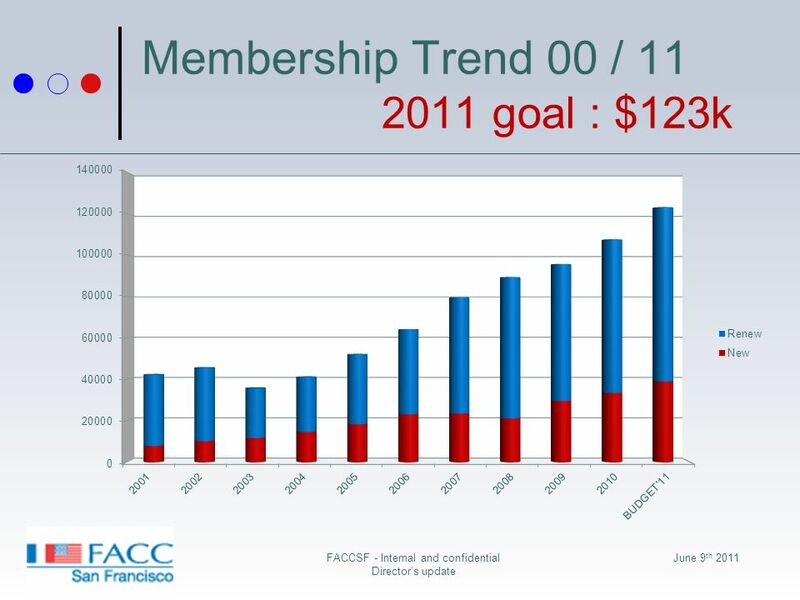 2011 goal: encourage new groups to be formed among FACC Members. 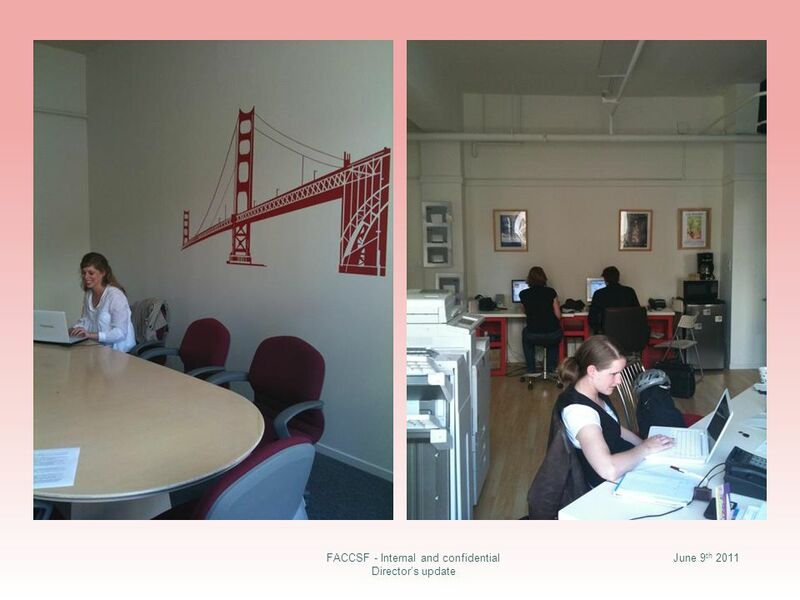 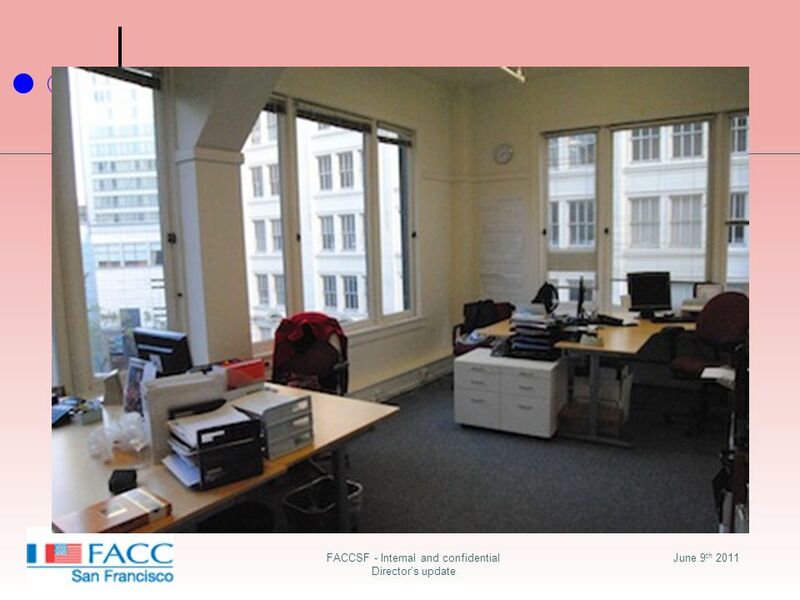 23 June 9 th 2011FACCSF - Internal and confidential Directors update Things you may not know! 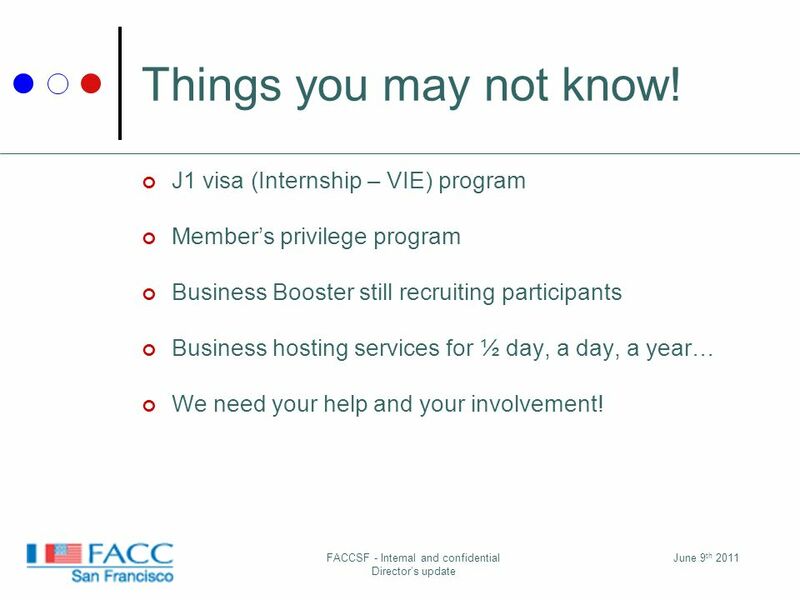 J1 visa (Internship – VIE) program Members privilege program Business Booster still recruiting participants Business hosting services for ½ day, a day, a year… We need your help and your involvement! 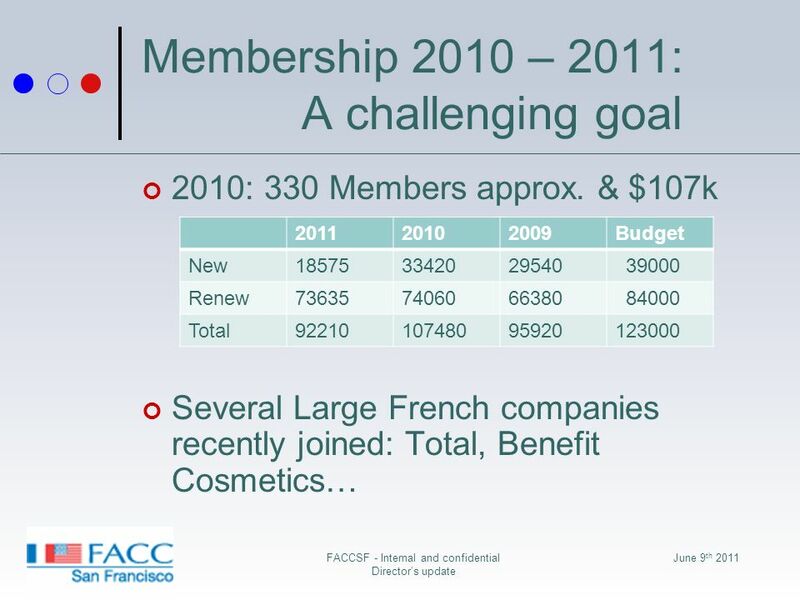 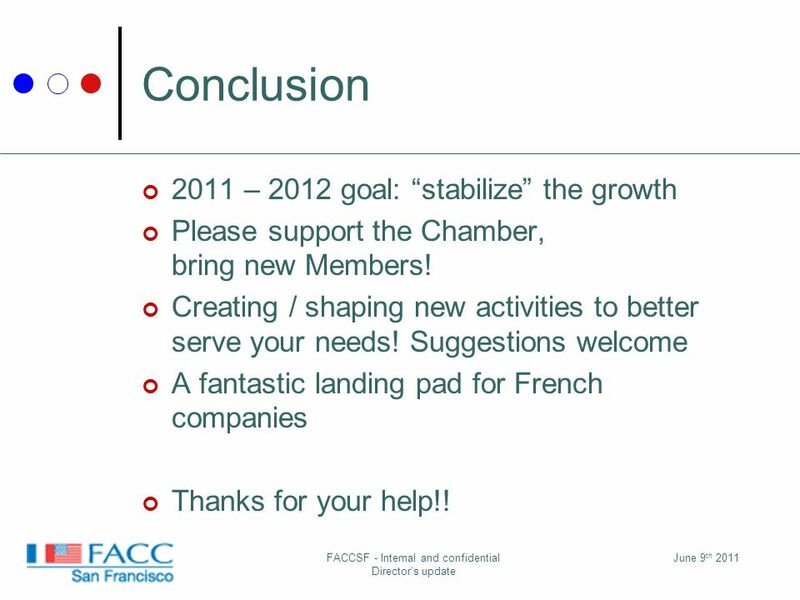 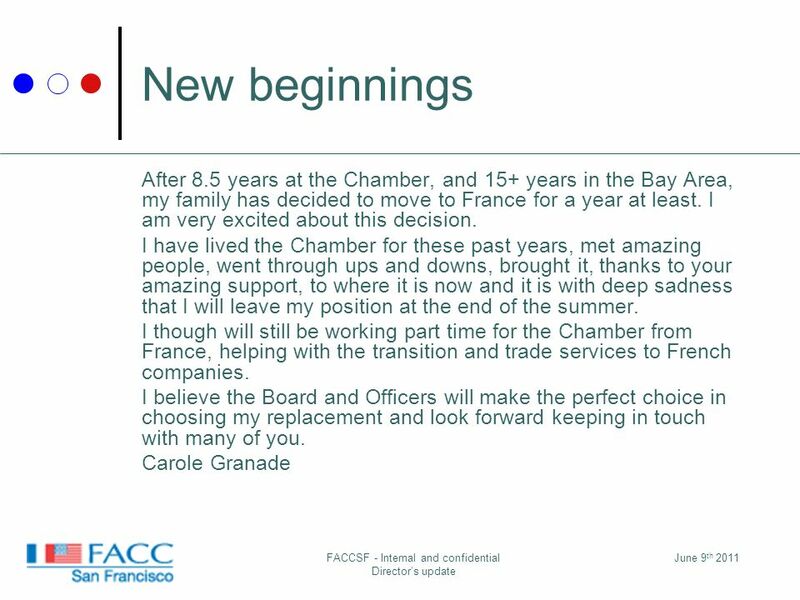 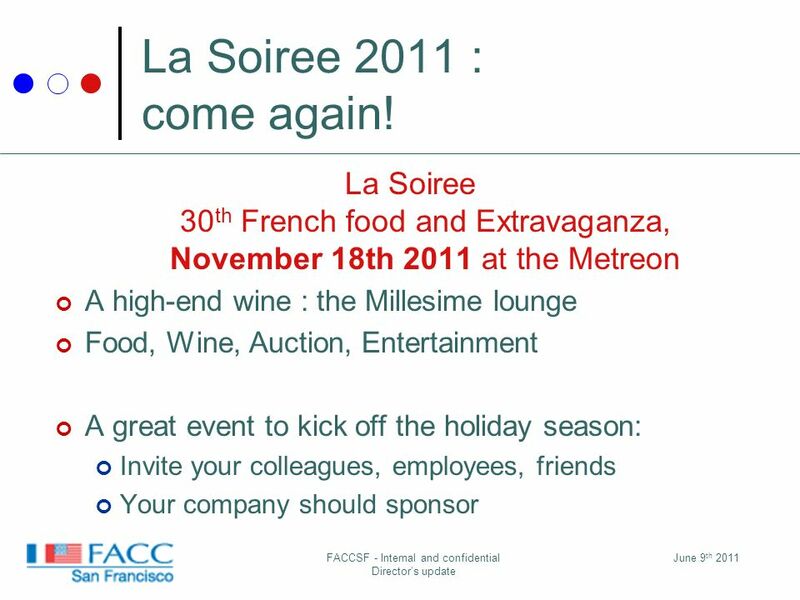 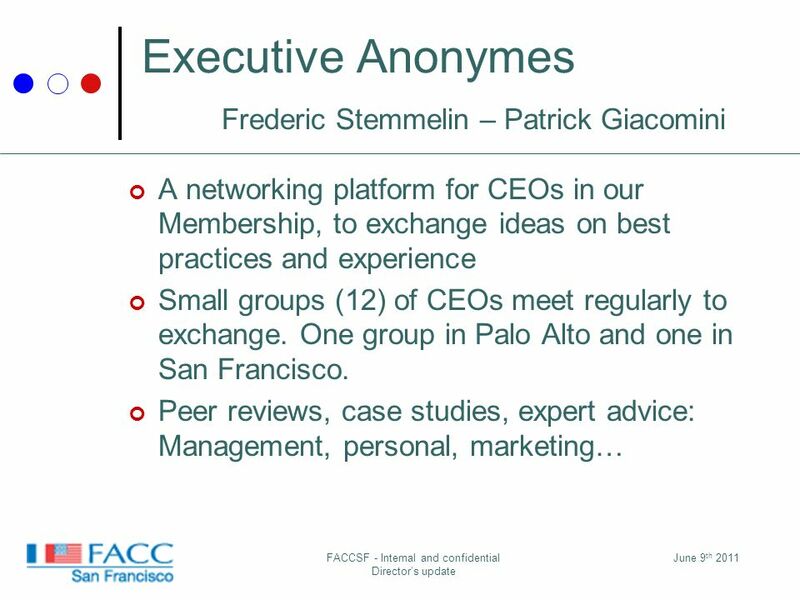 25 June 9 th 2011FACCSF - Internal and confidential Directors update Conclusion 2011 – 2012 goal: stabilize the growth Please support the Chamber, bring new Members! 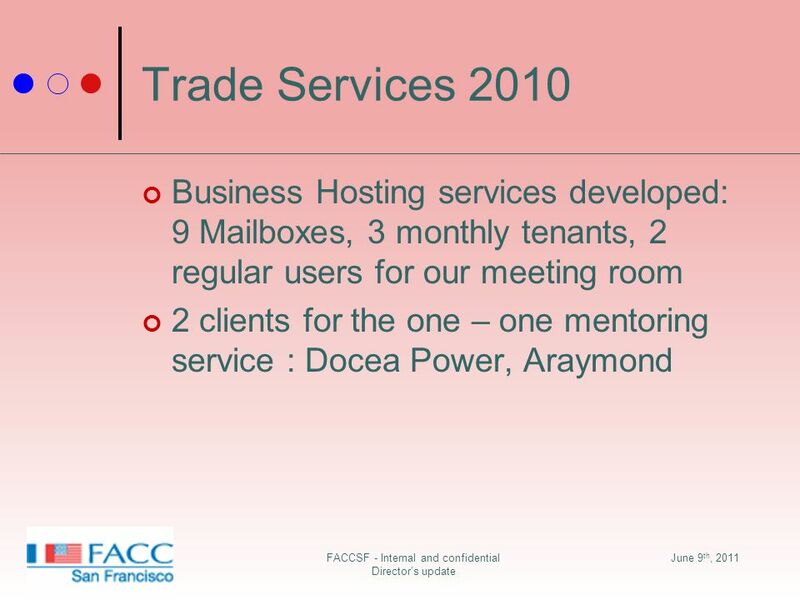 Creating / shaping new activities to better serve your needs! 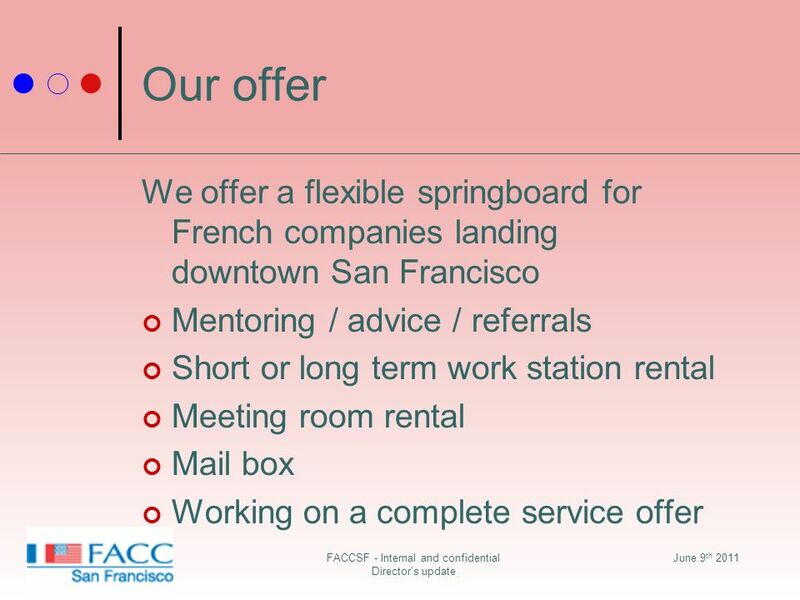 Suggestions welcome A fantastic landing pad for French companies Thanks for your help!! 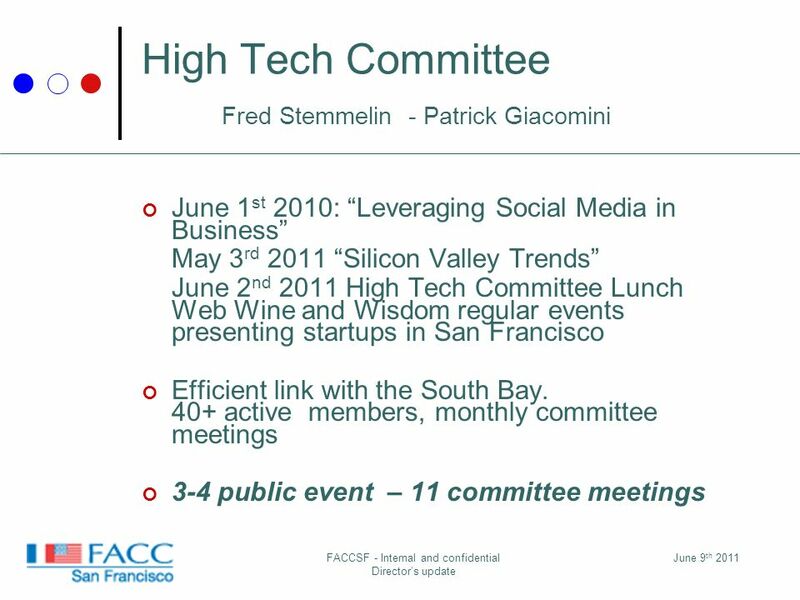 Download ppt "FACCSF General Meeting 2011 Directors update. 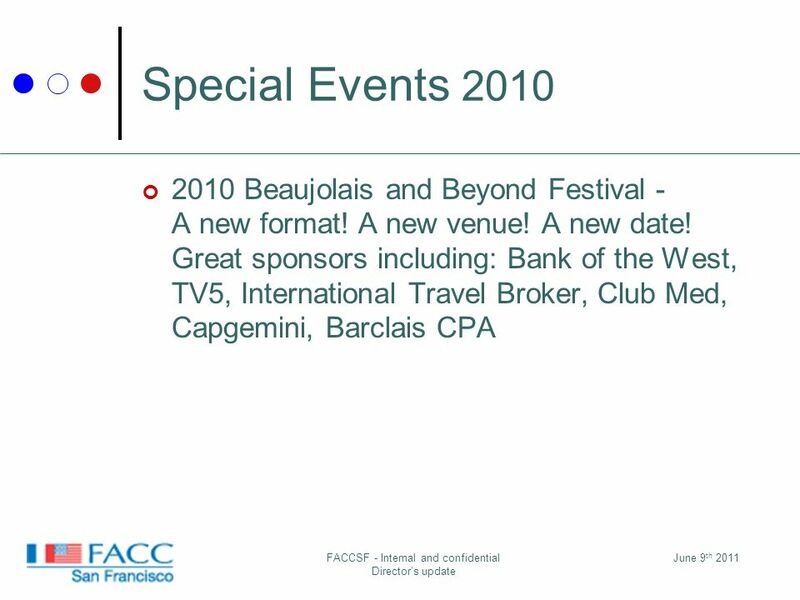 Introduction 2010 : the year of change Still on the rise More changes for the year 2011 June 9 th 2011FACCSF." 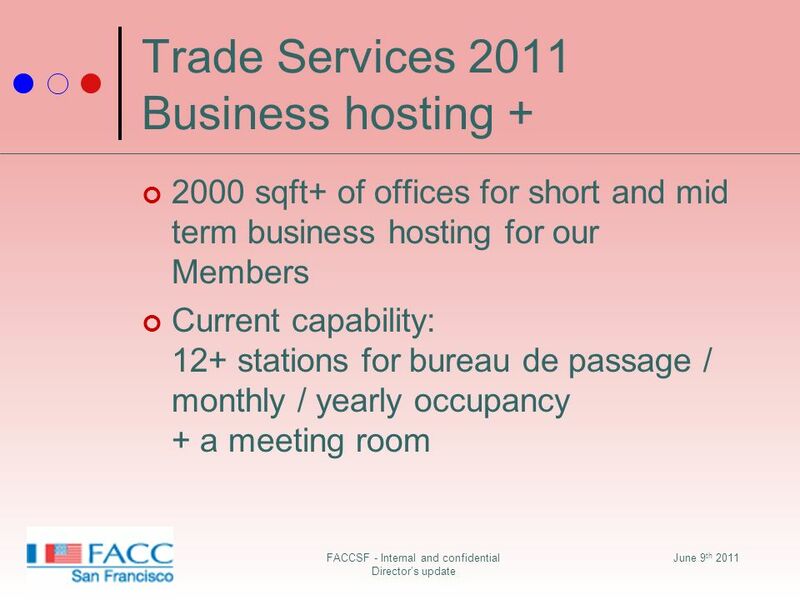 Welcome 2006 – 2007 Officers to Division D Officer Training & All Hands Meeting Neil McDonnell, ATM-B, AL Division D Governor Relax, its only Toastmasters. 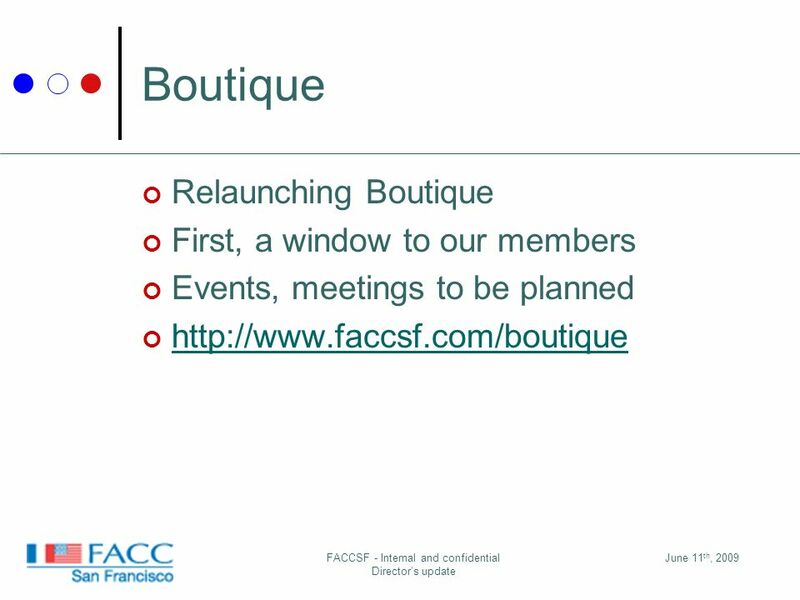 The Oregon Chapter of the American Meteorological Society (AMS) Presents: Whats new with the Oregon Climate Service (OCS) Featuring: Kathie Dello, Deputy. 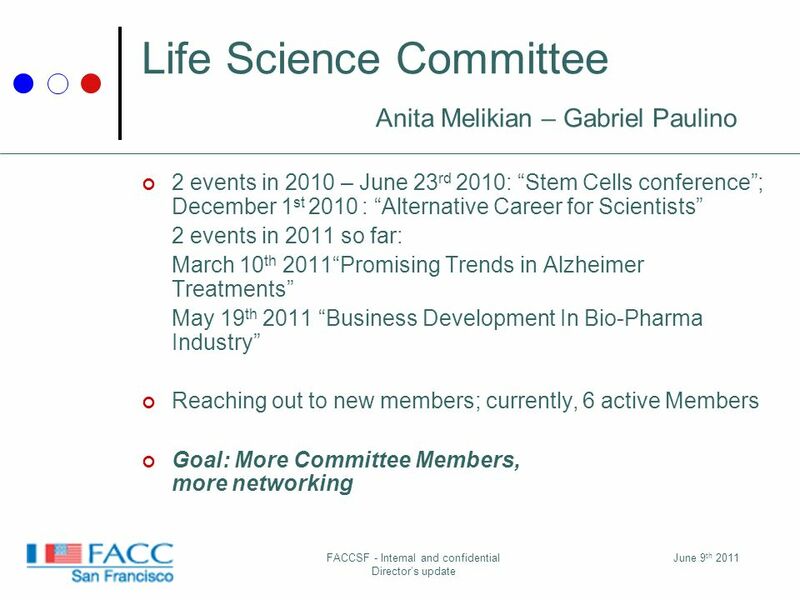 AIAA Utah Section University of Utah Student Branch Mark Sultan Utah Section Treasurer October 30 th, 2012. 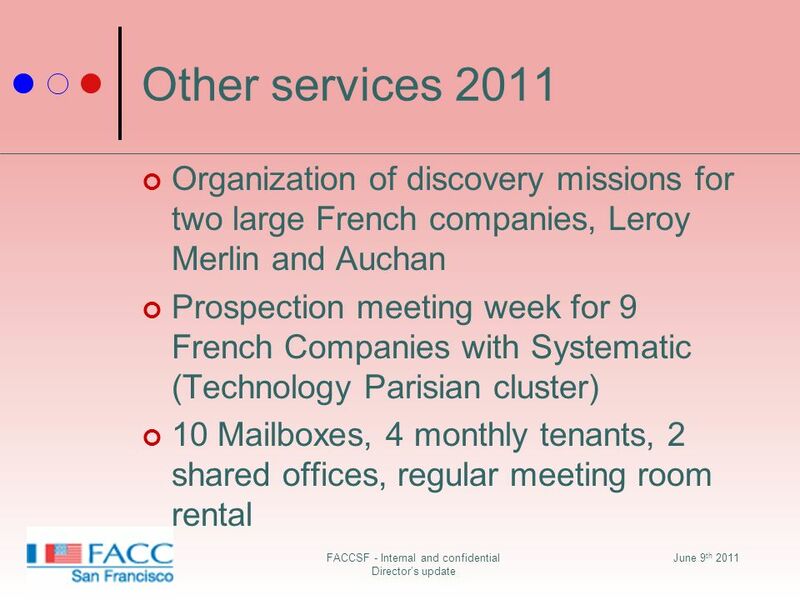 19th World Meeting of 2 CV Friends 26 – 31 July 2011 Salbris France. 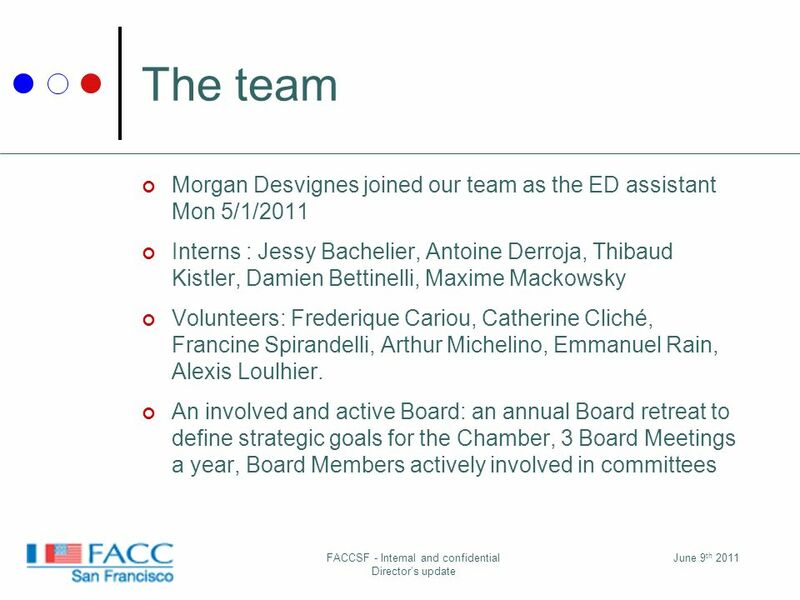 WORK PROGRAM Academic Year UNICA General Assembly 2010-University of Vienna. 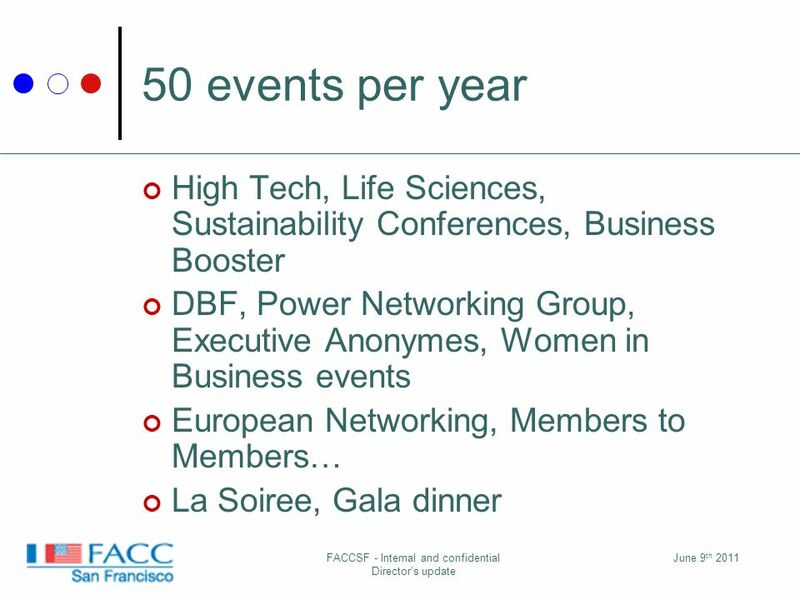 Libraries in Knowledge Society – Strategies for the Future The project Libraries in Knowledge Society – Strategies for the Future is funded by the Cultural. 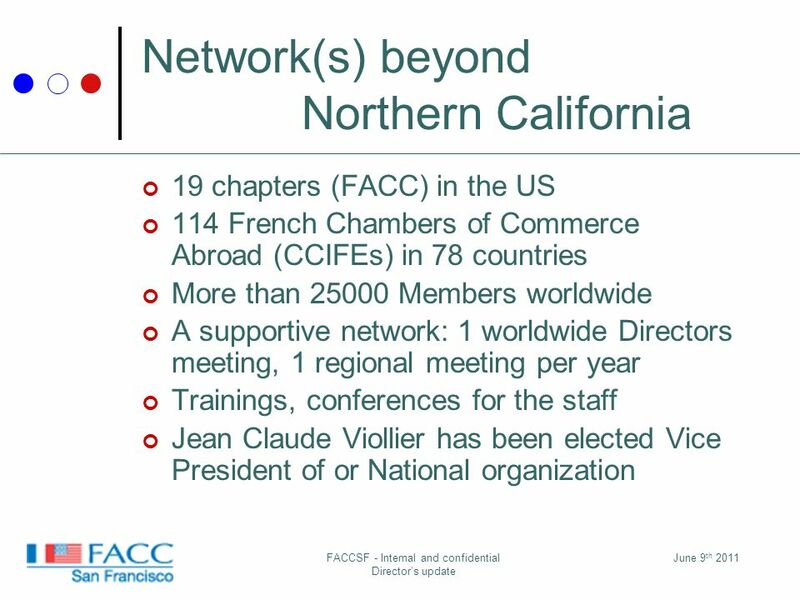 FY 2014-2015 PMI MONTEREY BAY ANNUAL MEETING MARCH 19, 2015 BARBARA LANG GAIL FARMER.